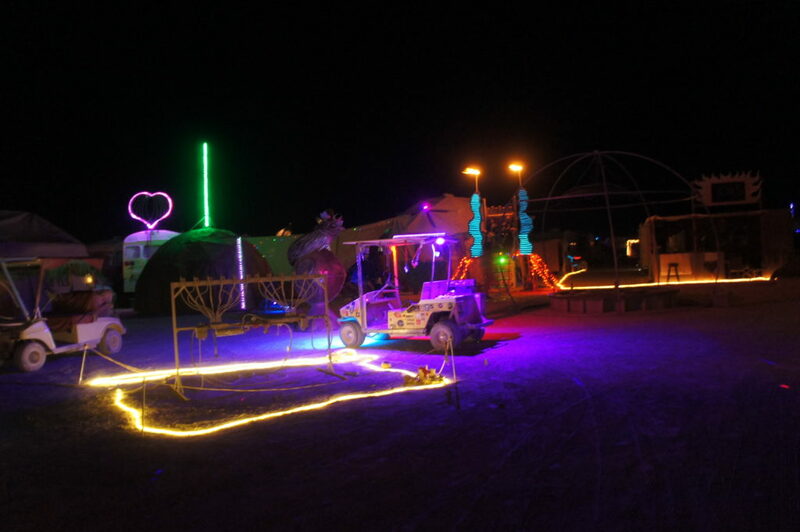 Read this if you want your Camp or Art Installation to have power! Grid is changing for 2018, so read all of this, even if you’re an experienced camper. If you have an RV, please note the new 2018 RV expectations below! We intend to have uninterrupted electricity for everyone in Illumination Village, 24 hours a day, but power is never “guaranteed.” Our grid supplies a huge space, the generator is pushed hard in the heat, so please be understanding. Your Grid Wizards are all volunteering, dues payin’ mofos, offer them a sandwich in the shade. In order to minimize fluctuations and solve the problems that can arise, we require all participants to follow the rules to be on our grid. • Older AC systems must be replaced with newer units of 15 amps or less. • AC systems must be set to “high,” or completely off. This minimizes the impact of the starting loads they cause on the system; steady power draw is better than fluctuation. • No daisy-chained power-strips or daisy-chained extension cords. Chaining them together can cause a short, or even a fire. Please plug large appliances into the above 10 gauge, triple tap cords–smaller items into a power strip or small extension cords. • Charge batteries and other devices at night time when possible. • No life sustaining or emergency equipment is allowed on our grid. No exceptions. For further details, please read this whole document on power. -If you have an RV, be prepared to unhook from the grid during peak hours and operate your own generator. -If needed, we can organize a village fuel mission with your gas cans, go to HELL Station, and refuel using the village’s prearranged fuel account. -You will need to pay the village in cash for fuel purchased at HELL Station— we cannot cover your fuel costs. Label and promptly reclaim your fuel can, and be very nice to whomever loaned their vehicle for this mission. -If the grid is overtaxed and we need to black out, invite your campmates in to snuggle in the cool air— make it fun, request cocktails or pedicures! !